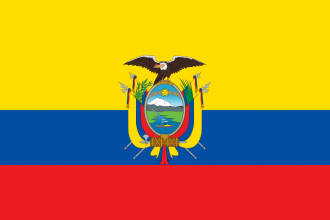 Ecuador is a small country located in northern South America. It borders Colombia to the northeast and Peru to the south. It also borders the Pacific Ocean. It may be problematic to play with its few resources and a tiny industry, though it (along with any other American country) is almost never threatened in a vanilla Singeplayer game. Ecuador has no unique events, it merely has generic events the majority of the world also have. Ecuador, lacking a unique national focus tree, uses the generic national focus tree instead. Ecuador starts as a socialist democratic country, with elections every 7 years. Ecuador's leader has no special traits. Ecuador starts with no national spirits and can only gain generic ones from its focus tree. Note that a national focus allows Democratic nations to send volunteers if all conditions are met. Ecuador starts with generic laws, and has a rather weak industry, with only 1 military factory, 4 civilian factories, and no dockyards. Ecuador also barely has any resources, that being a tiny amount of oil. Besides this, Ecuador also starts with 1 Unlocked Slot in the state of Ecuador. *These numbers represent the available resources for production at start of the game. The difference between the Surplus number and the Produced number are goods already used in factories. In the bracket are the complete numbers including those lost for trading. These are choices of ministers and design companies for Ecuador. Ecuador's military is laughable, and more of a defense force than anything. Players will need to build up their military if they want to expand, or even survive (in multiplayer games). Ecuador's one divison isn't even fully equipped. Ecuador has no navy or air force, though it does have facilities for ships and planes. Have a good strategy for Ecuador?